Microscopists in Germany show charges stabilised at the anode interface of a perovskite solar cell are the chief culprits behind hysteresis – one of the most pertinent mysteries in cutting-edge solar cell research. The solar cells we see commercially available today use silicon technology, which has a cap on the best performance achievable. Instead, many researchers have now turned to work on the next generation of solar cells: perovskites. Perovskites don’t have this top limit, however there are unsolved questions surrounding these promising materials. Illustration of potential (U), electric field (black arrows) and ion distribution for different migration paths for mobile ions: (a) if ions can migrate through the bulk of the perovskite layer, uniform electrostatic double layers will form at either electrode that screen the external device potential. (b) If ions migrate preferentially at grain boundaries, the electrostatic double layers and the electric field distribution will be heterogeneous. (c) In time-resolved Kelvin force probe microscopy, the contact potential difference response to a voltage-pulse or light-pulse is recorded in a pointwise spectroscopy approach subsequently at different positions on the sample. One of these is the problem of hysteresis. Perovskite researchers noticed that when they measured the power conversion efficiency during testing (how well the solar cell translates light into useable power), the results were inconsistent depending on the direction they measured – incredibly frustrating for a solar cell maker who just wants to know how good their creation is. For Stefan Weber, from Max Planck Institute for Polymer Research, Germany, this unknown triggered an insatiable curiosity: ‘There are weird effects going on in the cell, and I just want to understand and know what’s going.’ Consequently, his team set out to explore what was responsible for hysteresis. The team developed a new technique that, along with tremendous patience, allowed them for the first time to create a real time and space map of how the perovskite cell works. Using Kelvin force probe microscopy with a probe fixed on a single point the team switch on and off the bias to track the current on that position over time. Next, after waiting to make sure the cell is fully relaxed and checking that the conditions were the same, the team moved the probe ever so slightly to an adjacent point and repeated the experiment. Several thousands of points later, the team had enough information to create a video of the cell in action. Juan Bisquert is excited. A physicist working at Jaume I University in Spain he also wrestles with the physical principles and modelling interpretations of photovoltaic solar cells. He describes Weber’s work as ‘a beautiful reference’, explaining that in the cell, the slow moving mystery charges play havoc with local energies and fields, making computational modelling complex to say the least. ‘It was very difficult to imagine. Very very difficult. But now, we can see it!’ he says. Stefan this is outstanding. You bring the information we needed since 2014. Next time do it earlier. The differences observed in the measurements that we call hysteresis stem from a delay in relaxation of the cell back to an ‘off state’. This is why in one direction the cell appears to work better – it’s just turning off more slowly and skewing the results taken at the same time. 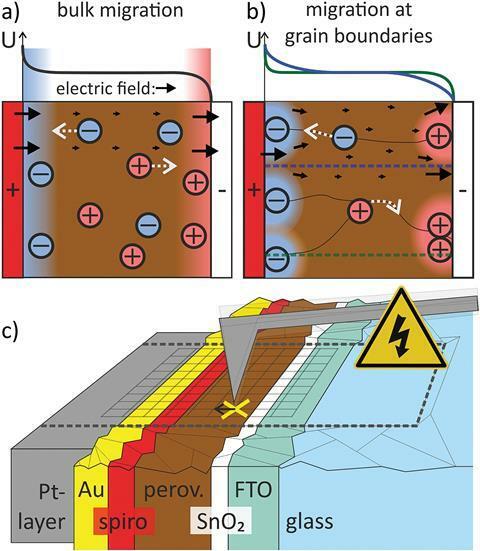 Some thought the reason for this was a slow migration of ions across the perovskite material from electrode to electrode. Weber’s work shows this is not the case. The movement of ions across the perovskite is actually pretty fast. The slow step seems to be getting them away from the electrodes in the first place. ‘The big message to the community from our work is that we need to find what exactly is stabilising the charges at the interfaces, and how we can modify this to guarantee a fast release,’ Weber says.